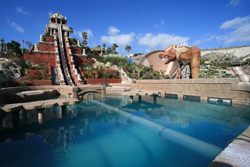 The official opening Ceremony of the long awaited Siam Park will take place on the 15th September 2008. The event will be a reception for invited guests only, hosted by the President of Loro Parque, Wolfgang Kiessling and the Director of Siam Park, Christoph Kiessling. The date of opening to the public has not yet been announced. The event will be presided over by HRH Princess Maha Chakri Sirindhorn from Thailand and will take place in the grounds of the Park. Siam Park has received 160 carp fish from Loro Parque. Their new environment is the 1,000 cubic metres of water of the Floating Market. 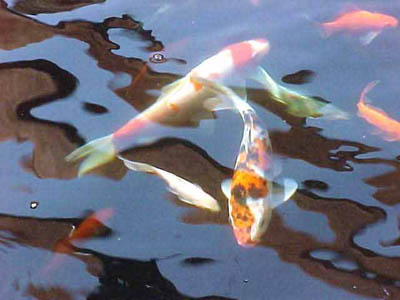 Known as common carp, (Cyprinus carpio), they are fresh water fish and relatives of the golden carp. They have been transported in special tanks accompanied by a biologist who took care of placing the fish in their new home in a process that took 5 hours. He will later follow up to make sure the fish have settled into the new surroundings. Their diet is mostly aquatic plants and they can reach up to 1.2m long and 40kg in weight, although the average is generally 60-90 cm long and around 9 kg. The carp fish are thought to bring good luck and they can live to be up to 50 years old. All the buildings of the Floating Market were designed by professor Ruetai and they really are authentic as the materials have been shipped over from Thailand. The houses come from an area about an hour and a half outside of Bangkok called Ayutaya and along with them also came carpenters who worked on the materials using all of their local skills and knowledge to make the village as it is today with all of the details crafted by hand. 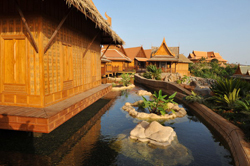 The Floating Market of Siam Park is the biggest representation of Siamese architecture outside of Asia and it houses the changing rooms, lockers and coffee bar, transporting its visitors to faraway lands.